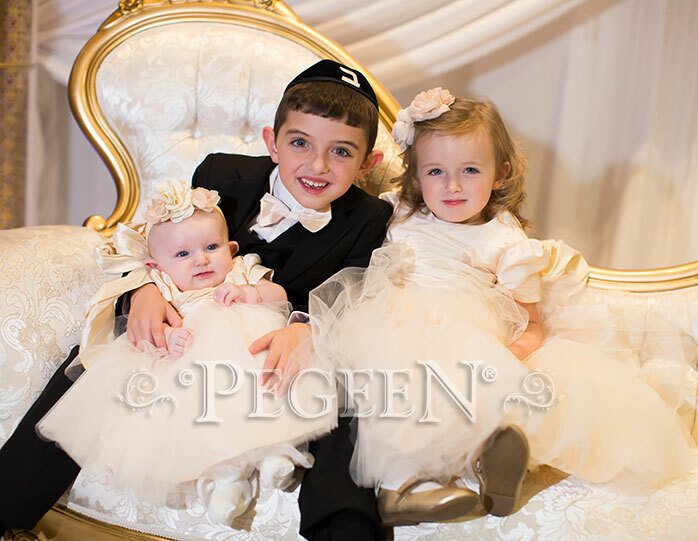 We were contacted by one of our repeat customers who wanted a dress for her daughter for her son's Bar Mitzvah. 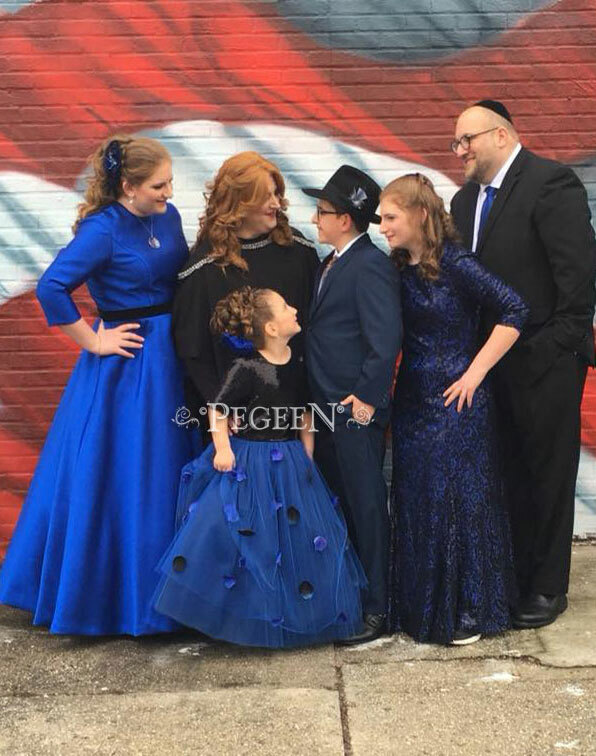 The entire family was to be dressed in sapphire blue and black. 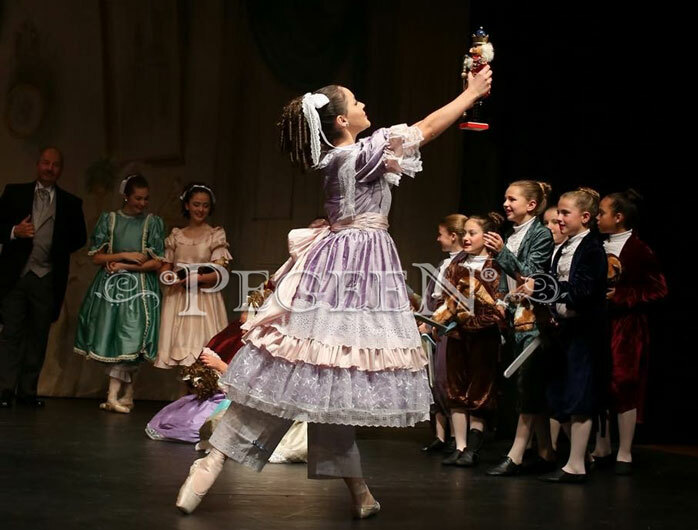 We did this lilac and pink silk Nutcracker Dress for Clara. Photo courtesy of Salem Ballet. To order the below style click HERE. Or to order, click photo. For this and any other from our Nutcracker Collection, or for that matter, any ballet, contact our head designer, a former dancer with her Masters in Dance and Theatre Arts. She can work with any company or lyrical dance troupe. Thank you for creating such beautiful looking and outstanding quality dresses! 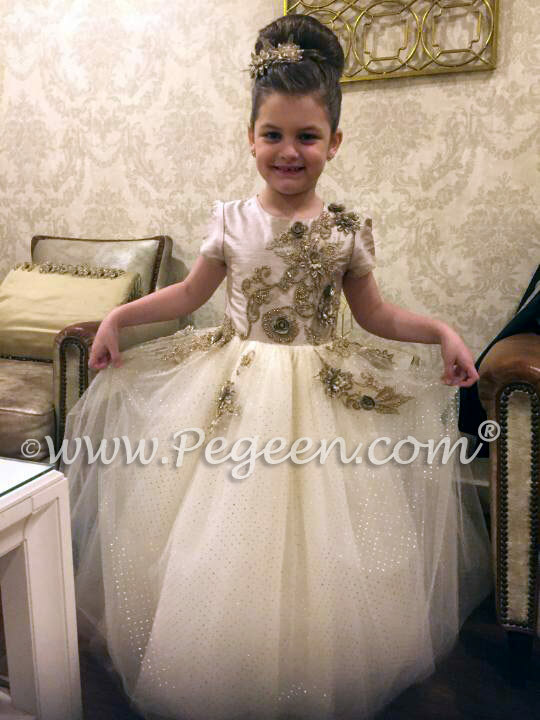 We did this special lace covered Jr Bridesmaids Dress for our customer. To order the below style click HERE. Or to order, click photo. How could you not fall in love with this two year old? 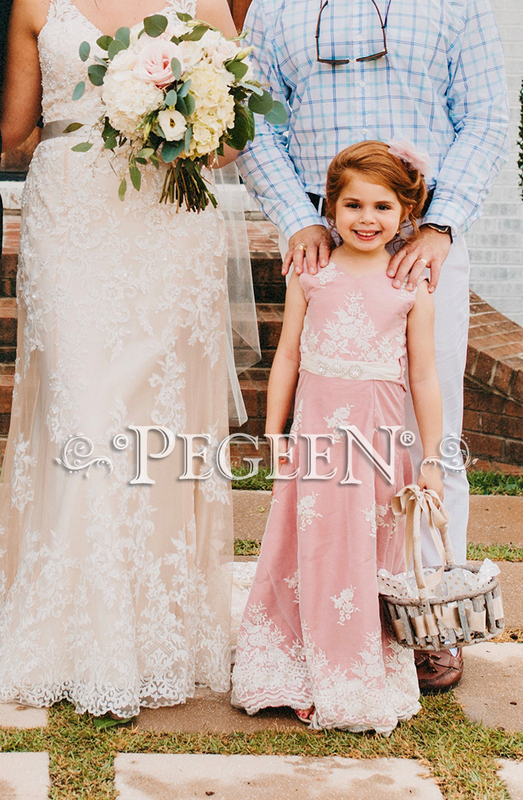 This customer chose to base her flower girl dresses on style 402 and wanted ballet pink for the base color and new ivory for the Pegeen Signature Bustle with pink hand made flowers. To order the below style click HERE. Or to order, click photo. 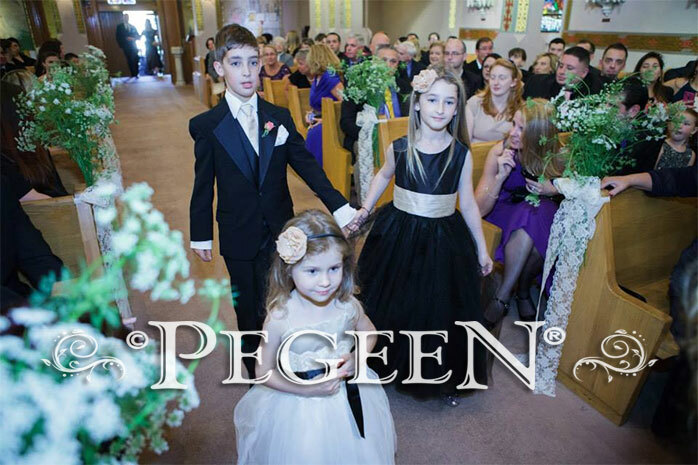 This customer chose style 402 in black and toffee for her flower girl dresses. To order the below style click HERE. Or to order, click photo. 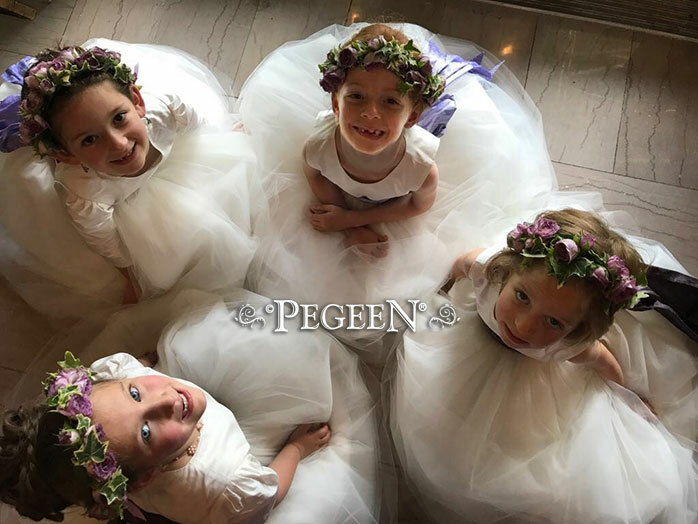 This customer chose to base her flower girl dresses on style 402 and wanted lavender shades (lilac and iris) for her sashes and antique white for the base color of these custom tulle flower girl dresses. Some girls had longer sleeves for religious purposes. To order the below style click HERE. Or to order, click photo. This customers chose various shades of pinks and cremes for her layered tulle skirt with the base color in champagne pink silk. To order the below style click HERE. Or to order, click photo. Style 398 BELOW - See details about this pink and tiffany blue silk flower girl dress, click HERE. Or to order, click photo. 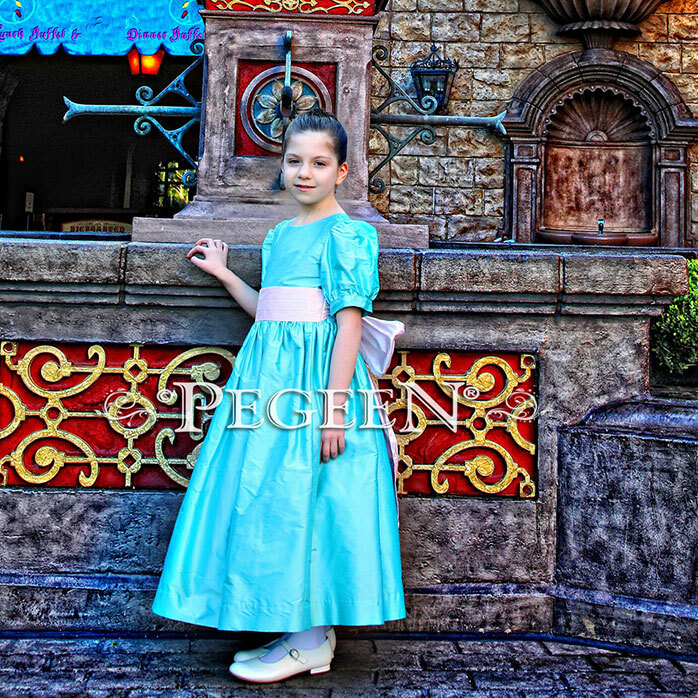 Our customer chose this Tiffany Blue and Peony Pink silk flower girl dress for her photo shoot at Disney World. 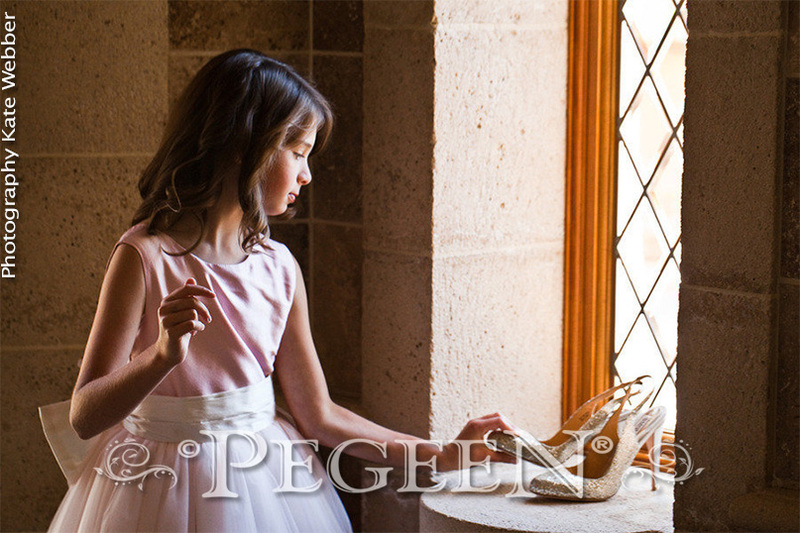 Style 398 BELOW - for details of this pink and tiffany blue and pink silk flower girl dress, click link HERE. Or to order, click photo. BELOW - Style 398 in gray shades of silk flower girl dresses with 3/4 sleeves, click link HERE. Or to order, click photo..
BELOW - "Oh my GWAD!!! Everything about this dress was drop dead beautiful. 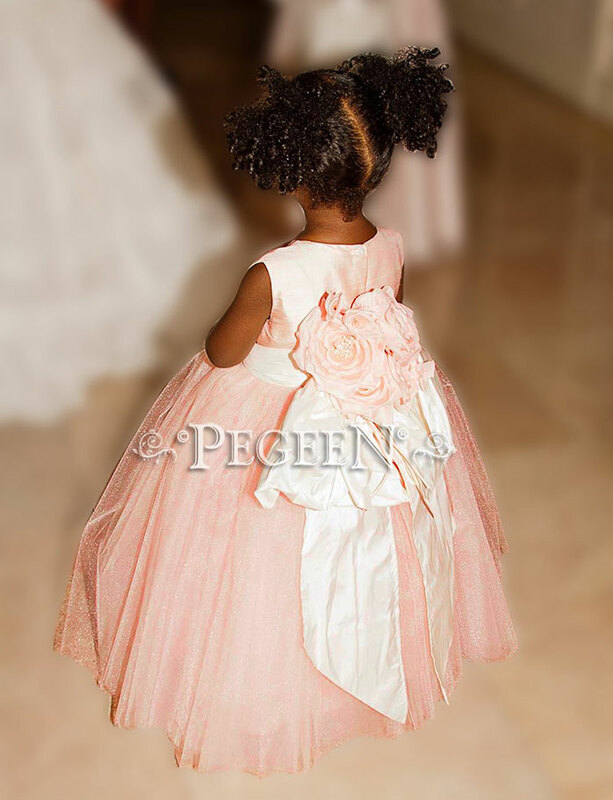 My flower girl dress was a hit and the little girl stole the show in her dress." 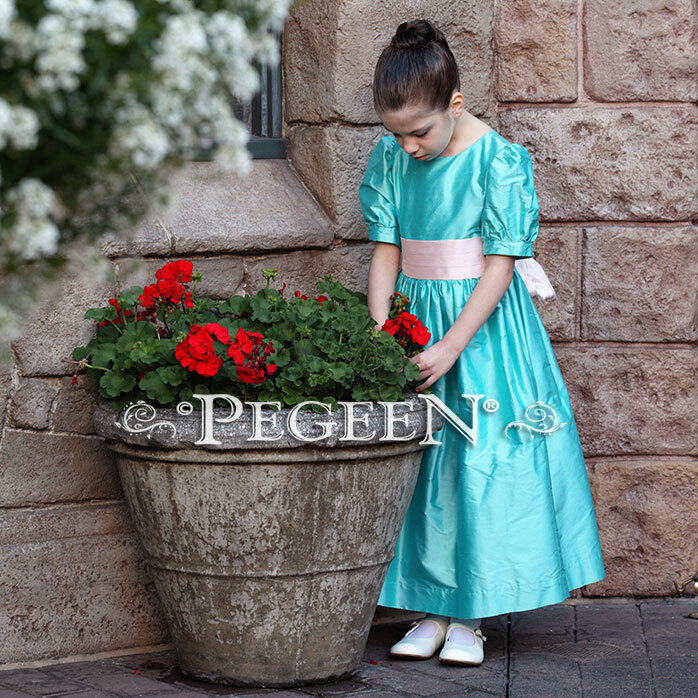 Style 922 for details of our Pegeen Fairy Tale Collection flower girl dress called The Princess Fairy HERE. Or to order, click photo. BELOW - Saying thank-you is not enough. The flower girls were so excited that they came in straight from the water to try them on! They are beautiful. 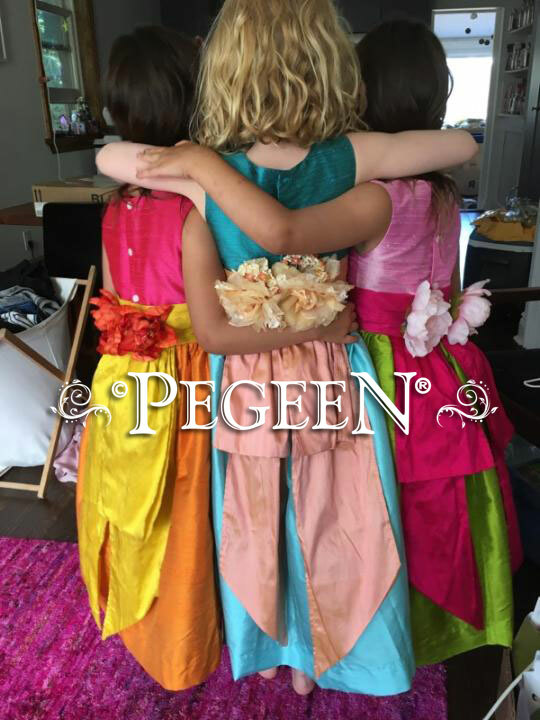 Our customer let her daughters choose their own colors once the style 383 was choosen. HERE. Or to order, click photo. 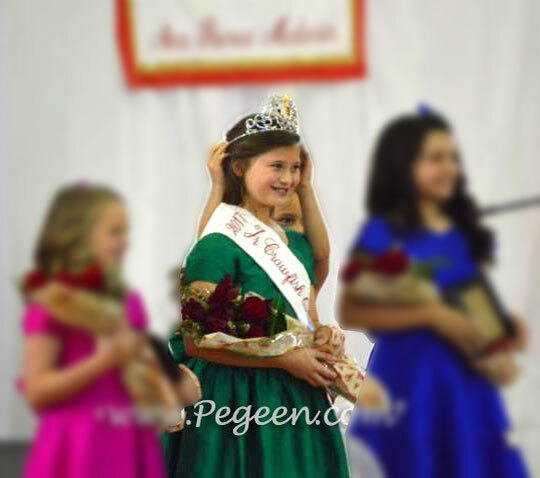 BELOW - "She walked off with the Junior crown. Thank you so, so much! It was even more than I imagined". Style 318 was choosen To read more information, click. HERE. Or to order, click photo. 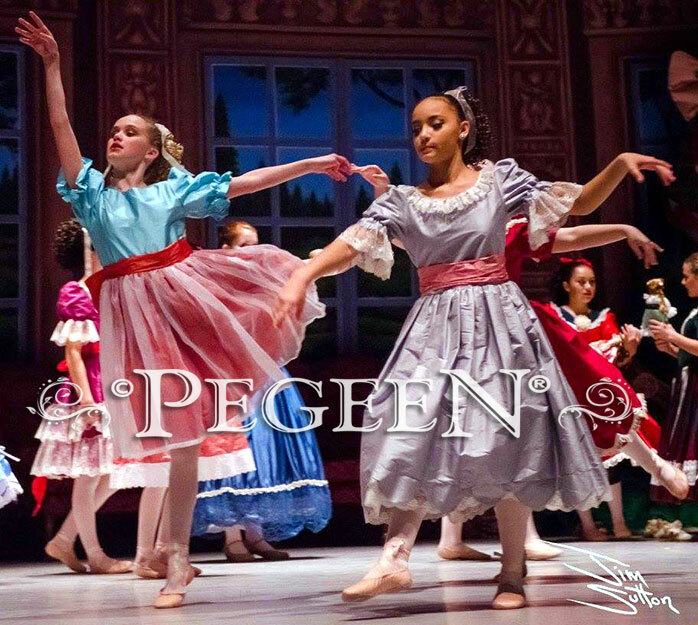 BELOW - We are back for our second year of Nutcracker Costumes from Pegeen! Valencia Ballet Co. Costumes above details click. HERE. Or to order, click photo. 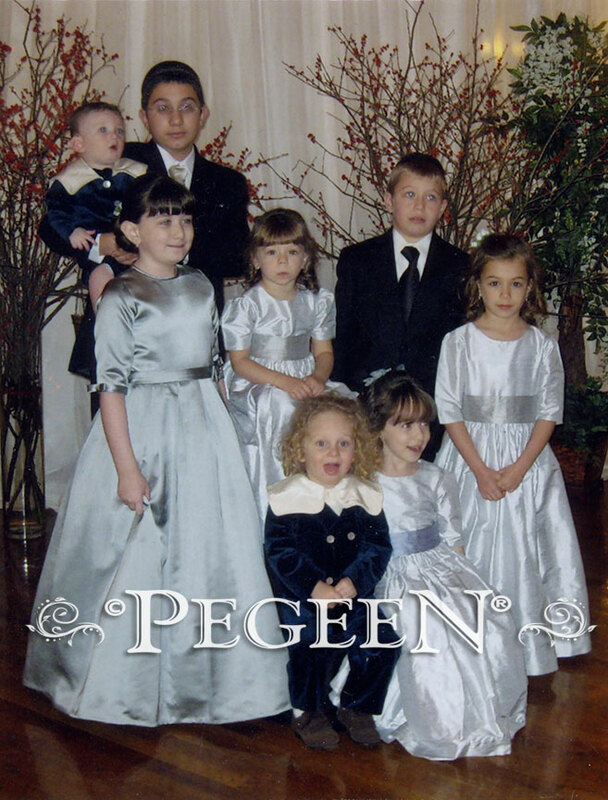 From the Pegeen Couture Collection - Style 402 was choosen. HERE. Or to order, click photo. 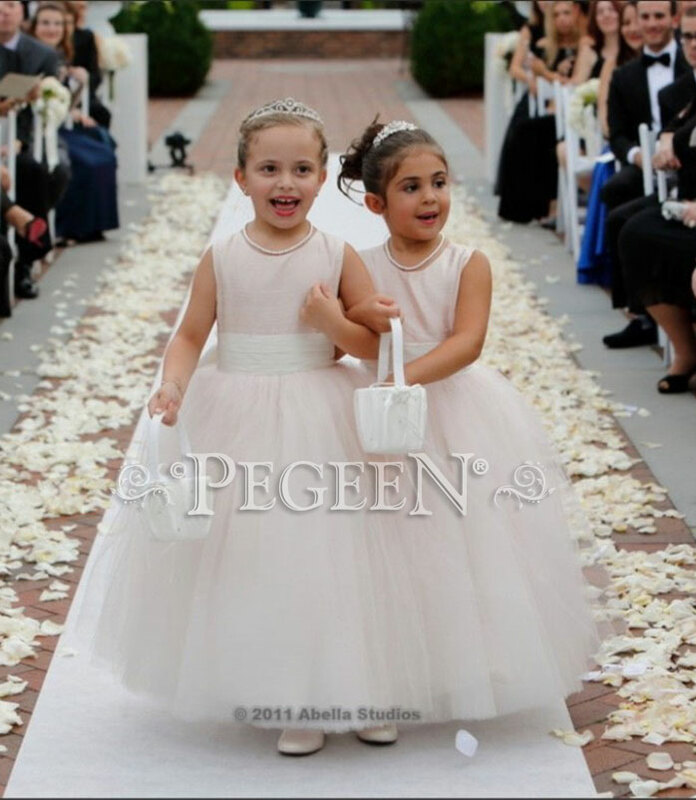 This customer chose to base her flower girl dresses on style 402 and wanted ballet pink for the base color and new ivory for the sashes. To order the below style click HERE. Or to order, click photo.